Despite what some may think, a modern home need not be cold and minimal. Juxtapose a techy light fixture alongside organic woods and poppy colors and the result will be utterly arresting, unique, and, yes, modern! To ignite your imagination and inspire you to look at your dining room in a new light, we rounded up five favorites that have show-stopping modern style. 1. Exposed brick sets the tone for this midcentury-meets-industrial dining space. 2. A high-contrast dining nook is highlighted by a wall of framed art and powerful pendant light in matte black. 3. 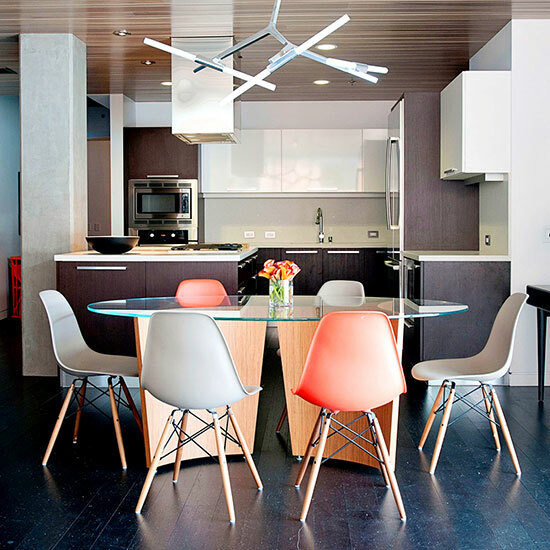 High-style meets cheerful optimism in this San Francisco dining space. 4. A mix of stately antiques and midcentury icons, plus the unmistakeable addition of modern art pieces, make this dining space wholly unique. 5. An eye-catching light fixture and large-scale art make this slick dining room feel luxuriously high-style and eclectic at once.